RP39345SS is rated 4.8 out of 5 by 12. Rated 5 out of 5 by Nature Girl from Perfect Replacement This was an exact match for my old one (which lasted 9 years). I could not find it anywhere else. It was very easy to install.. Rated 5 out of 5 by Colo Bill from Exactly what I needed! This spray and hose were an exact match for my original unit. It was very easy to install. Rated 5 out of 5 by Jimmysue from Updated design This was a replacement part and was a perfect match for the existing one. In fact it actually works better and appears that it will last longer. Rated 4 out of 5 by saltr from Delta Spray Hose Good replacement item.Arrived in fair amount of time. Would do it again. Rated 5 out of 5 by toobusy384 from best purchase ever just received delivery and sink up and running in less than two minutes. Considering I could not even find the part elsewhere I'd be safe in saying it was a good buy. Rated 4 out of 5 by Razorback from Better choice My original was white, upgraded to chrome. Have not installed it yet but do not foresee any problems. The amount of older parts you folks have in stock is incredible. You're definitely going in my Favorites section for further purchases. Thank-you! How do I unconnect the quick connect fitting? The diverter handle has come loose and I need to disconnect the spryer hose to get at the nut to tighten it. What is the hose length on this product? 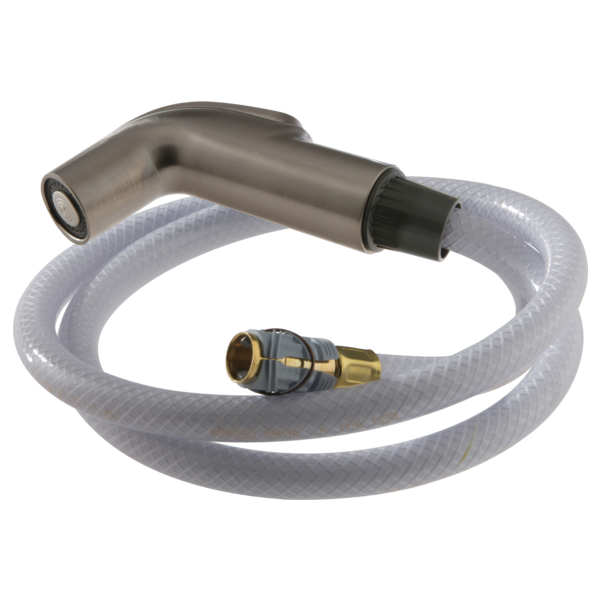 If less than 45&quot;, do you have a similar product with 45&quot; or longer hose? Thank you. my delta sprayer is stuck open! can this be fixed by cleaning with a solvent? Or is there parts to fix this problem? Or is it just best to replace it with a new sprayer head? I just need the plastic hose clips for RP34345. Can I just order that? Can I order the black plastic quick connect hose clips with spring for my model 172-ss kitchen faucet? If so, what is the part no.? To purchase the spray head only? Mine is leaking from behind the button but the hose is fine. Or is it possible to pop the button lose so I can clean behind it with out breaking the plastic? I have a model 172 or 174 Faucet and I need to replace the hose to the sprayer. What part do I need? I don't need the entire hose and sprayer assembly (Part 39345). I just need the hose. What part number is needed and where can I buy one? Need instructions on how to disconnect the spray and hose assembly from the faucet. There is a &quot;quick disconnect&quot; system that I can't figure out.